Delayed due to inclement weather, the Japan Aerospace Exploration Agency (JAXA) now is targeting 1:52 p.m. EDT Saturday, Sept. 22 (2:52 a.m. Sept. 23 in Japan), for the launch of its unpiloted H-II Transfer Vehicle-7 (HTV-7) cargo spacecraft. 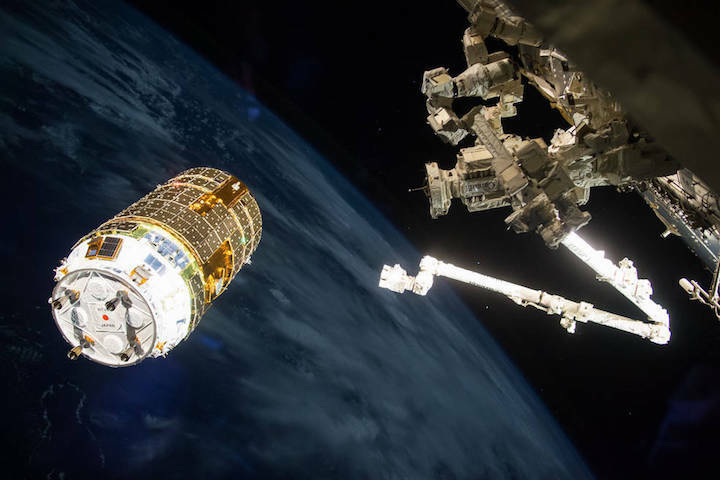 Loaded with more than five tons of supplies, spare parts and experiments, HTV-7 will launch to the International Space Station from the Tanegashima Space Center in southern Japan. Live coverage of the launch will begin at 1:30 p.m. on NASA Television and the agency’s website. NASA also will provide live coverage of the arrival and installation of the spacecraft at the space station Thursday, Sept. 27, beginning at 6:30 a.m. Capture is scheduled for 7:54 a.m. After a break, coverage will resume at 10:30 a.m. with installation of the spacecraft to the space station. HTV-7’s payload includes six new lithium-ion batteries and adapter plates to replace aging nickel-hydrogen batteries that make up part of the station’s electrical power system. Due to the delay of the HTV-7 launch, NASA is rescheduling two spacewalks to complete the installation of these new batteries and adapter plates, as well as the spacewalk preview media briefing. New times and dates will announced as soon as these activities are rescheduled.